Day 7. Not sure this is the right graphical direction, but I'm going with it. Thanks to everyone who reviewed my entry! I was quite surprised to see that it was rated so highly among the individual entries, despite the fact that the gameplay still needs quite some work. There were many other really great entries that I expected to be rated higher. It feels like quite a boost of confidence for me. Congratulations to everyone who participated; I know that even completing a game can be quite a challenge in itself that deserves recognition. I have really enjoyed participating in PyWeek, and in particular the amicable spirit in which people are encouraging and helping each other. Many thanks to all participants for their involvement, and to @mauve in particular for managing the website. I'm happy to see that this time, there were no complaints or issues with the use of Panda3D in my entry. I guess it has come a long way since the days when it only supported Python 2 and could not yet be installed using pip. It is encouraging since I think Panda3D is a fantastic tool for prototyping 3D games in Python within a short period of time. I'm looking forward to the next PyWeek! PS. As an anecdote, Let There Be Light was not even intended to be the final name for the game, as it no longer really reflects the gameplay very well; it was just a working title as I was thinking of incorporating light into the visual theming more. But I only remembered that I still had to come up with a permanent title minutes before the deadline, and I did not manage to come up with a new title before the time ran out. Oh well! Oh, you can use shift+S to save a screenshot in the game folder. Whew! That was a fun but stressful week. Whew! Despite not actually have a lose condition before the last day, and still having to hunt down sound effects in the hour before the challenge ended, I nonetheless managed to submit something in time that can unironically be called a "game". And I learned lots of cool things on the way, such as how ot do Nodal Analysis in numpy and what a catenary is. This PyWeek was quite different for me than other ones: this is my first solo entry, I had a lot less time due to not being able to take a week off work, and I had chosen a particularly complex interpretation of the theme. I will probably choose a simpler game concept next time. The downside of a simulation is that it's hard to turn it into a game, and keep it balanced so that it stays challenging but not impossible. But it felt really rewarding to reach the point where it became game-like enough for people from the IRC channel to play my game and share their high scores with me, even beating my own. Given more time, I would have been able to create a more sustained and balanced experience. 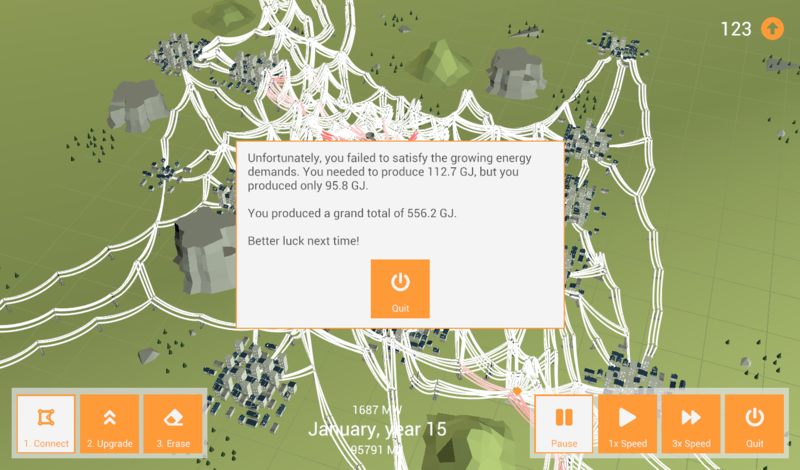 When playing the game for a long time, you may notice that the end-game involves a gigantic mess of wires and running out of space around the generator. The plan was to make it possible to allow you to build more generators over time, but I just didn't get to that. I think it reaches a point where it just becomes mathematically impossible to proceed, but I haven't worked out the math. I would have also improved the long-game performance; it's not bad, but it does currently solve a numpy matrix of a big linear system with Kirchoff's equations every frame, even though I could definitely optimize it to only recompute the voltages on each node when the grid has been altered. Even in a thread, if needed. So don't get the impression that it's Panda3D's fault if it runs slowly. Panda3D had a bit of a reputation in PyWeek due to the difficulty installing, but I think that is history now since it can be easily installed using pip nowadays. And I'm not using fancy shaders, so no high-end GPU is needed. I'm not as confident about macOS, because, well, Apple seems to be committed to abandoning open standards like OpenGL. It seems to be playable on my old Mac Mini but the whole game does appear much darker than it should. Thanks to all for a fun PyWeek experience! I'm looking forward to playing the other entries on here.